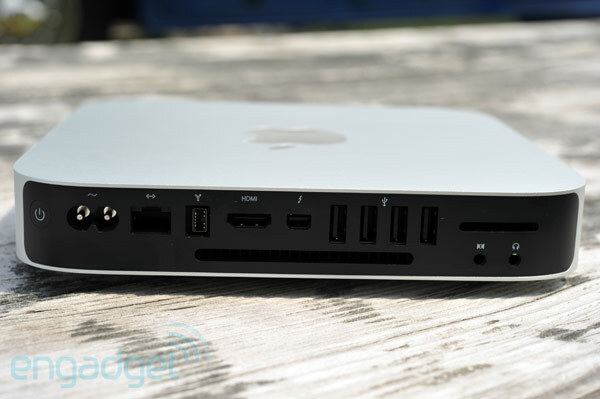 For those familiar with last year's Mac mini, what you're peering at above isn't likely to strike you as jarring. Heck, it may even seem somewhat vanilla at this point. 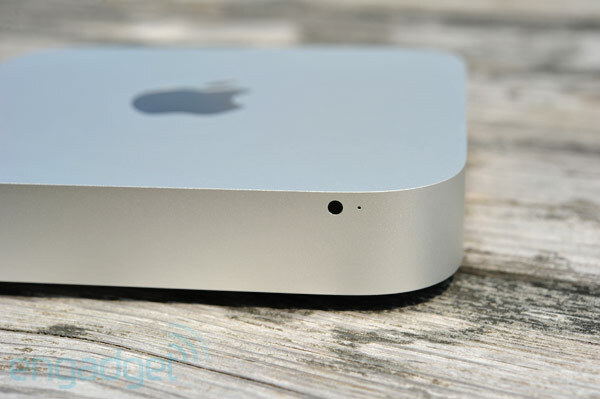 In truth, Apple did exceedingly little in terms of design changes with the mid 2011 Mac mini, but given the relatively recent cosmetic overhaul, it's not like we were genuinely expecting anything above a top-to-bottom spec bump. And that, friends, is exactly what we've received. The mini remains quite the curious beast in Cupertino's line -- it's the almost-HTPC that living room junkies are longing for, yet it's still a country mile from being the headless mid-tower that Apple steadfastly refuses to build. It's hardly a PC for the simpleton (given that it's on you to hunt down a mouse, keyboard and monitor), and it's actually taking a giant leap backwards on one particularly important front. Care to hear more? You'll find our full review just past the break. A solid little Mac, but losing the optical drive while not shrinking in size strikes us as a very strange design decision. 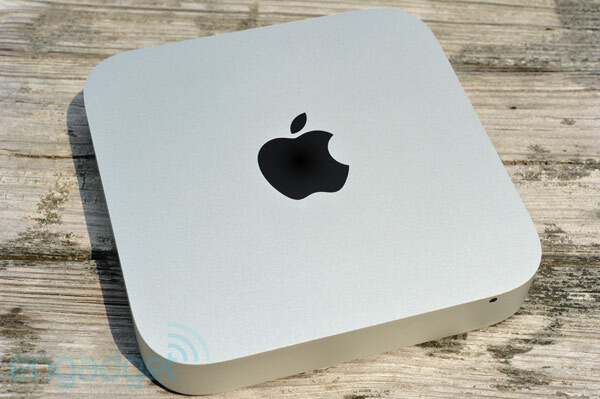 How would you rate the Mac mini (mid 2011)? Make no mistake about it -- the mini is just gorgeous to look at. As with the prior model, this 2.7 pound slab of aluminum looks nicer than its price tag indicates, and it honestly feels more like a decoration than a computer. It's sized at 7.7 x 7.7 x 1.4 inches, exactly the same as its predecessor, and outside of the chromed Apple logo on the top, a matte black strip of ports on the rear and a similarly hued lid on the bottom, it's a clean sweep of brushed silver. It'll sit nicely on its edge for those contemplating a vertical installation, but the protruding lid on the bottom makes it a little less elegant for those applications. Speaking of the rear, the dozen connectors found there aren't cosmetically different than those on the last build. From left to right, you'll find an AC input, gigabit Ethernet jack, FireWire 800 port, HDMI (full-size), Thunderbolt, four USB 2.0 sockets, an SDXC slot, an audio input and a 3.5mm headphone port. 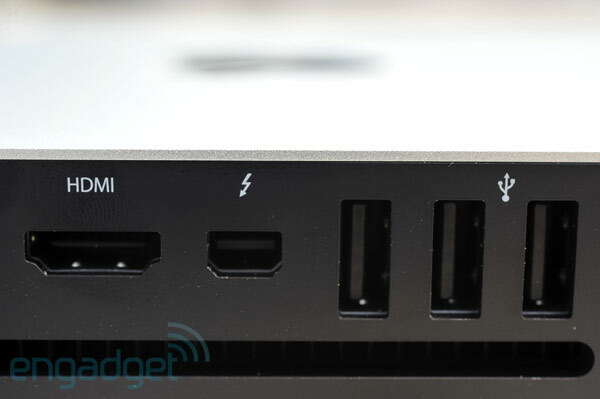 Funny enough, last year's DisplayPort socket looks identical to this year's Thunderbolt connector, and not surprisingly, DisplayPort monitors and peripherals will happily fit themselves in with no adapters needed. For what it's worth, Apple does include an HDMI-to-DVI adapter, but oddly, no Thunderbolt dongle. Sure, we know those cables are laced in gold, but what better way to encourage adoption of a new I/O port than to toss in an appendage for newcomers? Even a DisplayPort / Thunderbolt-to-HDMI or DVI cable would've been greatly appreciated -- making it simple to hook up dual displays right from the get-go would have seriously tickled our fancy. Tinkerers are bound to love that bottom lid... and then grow frustrated by what's underneath; a simple twist reveals a WiFi module, cooling fan, two SODIMM slots and plenty of other, not-easily-accessible components. Our test unit came with a pair of 1GB memory modules, but even the greenest DIYer could swap those out with more sizable ones -- a couple of snaps and a tug is all it took. Unfortunately, we're still miffed at Apple's decision to keep the HDD away from a user's fingertips. If we had our druthers, the RAM wouldn't be the only thing that's just a few clips away, but alas, we're stuck with what we've got. We shouldn't have to chide Intel and Apple (and whoever else wants to claim responsibility) for not having USB 3.0 on Macs in the year 2011, but regretfully, we are. A foursome of USB 2.0 ports are cute, but when sub-$400 netbooks are boasting SuperSpeed USB ports... well, let's just say it's about time Apple took notice. Unfortunately, Steve Jobs still seems to think that the newest iteration of the world's most popular port isn't going anywhere fast, so we're apt to see Thunderbolt pushed as the true USB 2.0 replacement. That doesn't mean we have to like it, though. Given that it's the only new port onboard, it's worth mentioning that Thunderbolt is a fantastic addition to the array. The ability to daisy-chain monitors and peripherals off of it enables the bantam desktop to play grown-up in a few key ways. 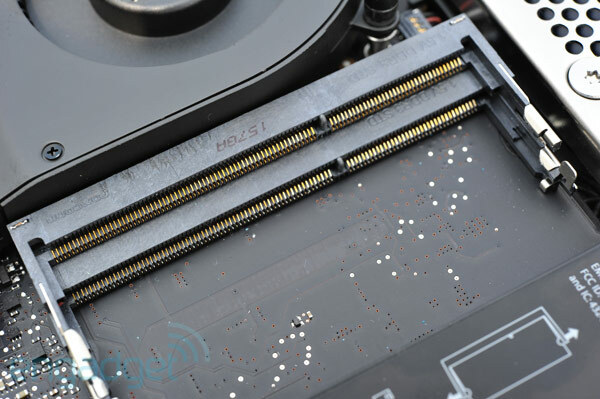 It'll handle vast display resolutions (up to 2,560 x 1,600; the HDMI socket tops out at 1,920 x 1,200) and outlandish storage solutions, and thanks to the revised CPU, it can more easily handle 'em with poise (more on that in a bit). It's also worth pointing out that the power supply is still internalized (huzzah! ), leaving you with nary a power brick to fiddle with. Let's all breathe a simultaneous sigh of relief, cool? We tested out the base mini -- a $599 rig with a 2.3GHz dual-core Core i5, 2GB of 1333MHz DDR3 memory, a 500GB (5,400RPM) hard drive and Intel's HD Graphics 3000 processor with 288MB of DDR3 SDRAM, which is shared with main memory. All things considered, that's a halfway decent spread for an MSRP that's $100 less than the base model of 2010, but alas, there's no optical drive to pay for, either. Whisking about Lion and handling mundane tasks (we're looking at you, Office) was a breeze, though we confess to getting a little impatient when waiting for heavier applications to load for the first time. Bootup routinely took right around 45 seconds from off to usable, and there's no question that an SSD swap would do wonders for the general snappiness of the system. We also noticed a bit of slowdown after having Photoshop, Word, Firefox, Chrome, TweetDeck and Lightroom open for around three hours. We're pinning that on the lowly 2GB of RAM; granted, we were intentionally pushing it, but those hoping to get creative work done on a mini will certainly want to invest in a few more gigs (and a speedier disk drive). Thankfully, 2GB proved plenty when playing back 1080p files, YouTube HD clips and anything we could find in Boxee / Hulu. On the gaming front, the results were downright impressive. We fired up Half Life 2: Episode 2, turned the details to "High" and cranked the resolution to 1,920 x 1,200 to natively fill our 24-inch panel. The result? A consistent 31 frames per second. Granted, that title isn't exactly the newest in the stack, but this at least confirms that light-duty gaming with your favorites from yesteryear is indeed possible. Turning to XBench and Geekbench -- staples in the world of OS X benchmarking -- we found similarly impressive stats. This particular system scored 291.21 (overall) / 228.84 (CPU) / 400.30 (Thread Test) on the former, while notching 5,919 on the latter. 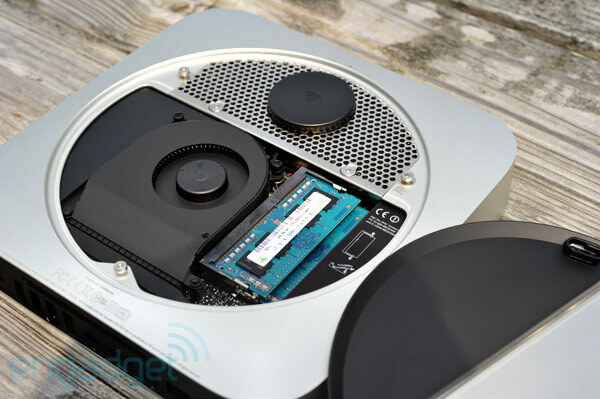 For comparison's sake, the mid 2010 Mac mini scored 3385 on Geekbench, proving that the Core i5-infused newcomer is leaps and bounds more powerful in terms of raw number crunching. Like it or not (Apple's firmly on the 'not' side from what we can gather), the Mac mini looks like it'd be the ideal home theater PC. It's tiny, beautiful, and it supports insanely high resolutions and just about any HDTV / monitor you could think of. It's also a dream come true for heavy Boxee users and iPhone owners; just toss up the overlay and allow your phone to handle the controls. It couldn't be simpler, and if you're able to find an easy solution like this that negates the need for a dedicated mouse and keyboard, you might be just in heaven. It's also worth noting that regardless of how hard we pushed this thing, it simply refused to get even a notch above 'warm,' and the fan noise was practically inaudible from ten feet out. But here's the rub. While we're able to forgive the mini for not having room for a TV tuner (internally, at least), the sudden and unwarranted departure of the optical drive is downright baffling. We know -- too many people will simply write this off without a second thought, rationalizing it as Apple just killing off something that's on the way out, but it's a decision that we wholeheartedly disagree with. Losing the floppy drive when you have a smattering of other options is one thing; but spiking the optical drive? On a desktop computer? It's a terrible, terrible decision, and the truly ludicrous part is that Apple didn't even shrink the size the chassis to make up for it. As much as Apple would love to have you believe that nothing worthwhile will ever ship on a physical disc again, the HTPC argument alone rebukes that. Having access to Hulu, Boxee, iTunes and Netflix is just half of the story -- there aren't too many HTPC owners that never pay their local Redbox a visit. Last year's mini could easily play back any DVD rental (read: the only reasonable way to get newer movies at home), install applications that shipped on physical discs, rip your CD collection, and even burn back content and homemade movies. For whatever reason, Apple has decided that you won't need to do any of that with this year's mini, and the only consolation prize is a $100 discount at the register. Gee, thanks for the option. In reality, Apple spiraled off in the wrong direction here. Instead of downgrading the mini from optical drive to slotless, it should've swallowed its misplaced disdain for Blu-ray and finally offered the clear next-gen format victor as a build-to-order option. We can pay $600 (!) to swap in a 256GB SSD in what amounts to a mid-level desktop with no expansion options, but we can't pay $100 to throw in a Blu-ray drive in what's obviously a made-for-HTPC machine? It's not only senseless, it's laughable. In case it's not crystal clear, Apple has made it effectively impossible for us to recommend this as a media PC, but those dead-set on making it one will be glad to find that multichannel audio output is supported over HDMI, and finding the proper resolution to fit one's TV is a lesson in simplicity. So, for those content with a streaming-only HTPC option, this one's about as gorgeous as they come, but we'd definitely recommend a phone-based remote option. Apple doesn't make a combination mouse / keyboard, and even the best of those tend to feel awkward in use. In all honesty, HTPC diehards are better off dropping $99 on an Apple TV and bidding the hassle adieu -- without an optical drive, we're struggling to see why one would pay an extra $500 for something that'll never leave the den. It's not often that Apple products take a turn for the worse when a new revision comes out, but there's no question that the design of 2010's mini is superior to the design of this guy. Sure, the revised edition is a heck of a lot more powerful and $100 cheaper, but it's in the same infelicitous spot that it's always been in: by the time you invest in a halfway decent keyboard, mouse and monitor, you're pushing $850+ for a mid-level machine with a sluggish hard drive, the bare minimum amount of RAM that we'd recommend for Lion, no USB 3.0 and no optical drive. For whatever reason, Apple's made the new mini even less useful than the last, and while a Benjamin off the sticker is appreciated, it hardly puts it in a new class in terms of value. On the upside, OS X Lion is a superbly polished operating system, and the mini itself is easily the most stunning SFF PC on the market today. It's also eerily quiet, power efficient and cool, and it's everything the average college student or studio apartment dweller needs. Handling 1080p multimedia, basic video / photo editing and even gaming is no problem, but we just can't get over the paradoxes here. Apple dumbs down the back panel so the DIYers among us can't access the hard drive, but selling a computer without three essential peripherals (monitor, keyboard and mouse) ensures that the target market will be one that's at least remotely familiar with technobabble. In isolation, the Mac mini is a fine computer. It's quick on its feet, and it's happy both beside your TV or in the office. As with all Macs, there's an elusive premium that comes with the overall software experience, and those placing a high value on OS X and the bundled iLife suite may find the compromises here acceptable. But imagining how stellar this bundle of joy could have been with a Blu-ray drive (or any drive) is an impossible vision to shake. Perhaps it's just getting more difficult to logically recommend a Mac desktop, particularly one that's underpowered for serious AV work and near impossible to upgrade. Apple has fine-tuned its laptop options in such a way that makes the revamped mini look underwhelming -- grandiose thoughts of an entry-level MacBook Air docked to a (reasonably priced) 27-inch Thunderbolt Display continue to find their way into our brains. If you're still fixated on the beauty here, our honest recommendation is to pick up last year's model as it inevitably drops in price (and in turn, increases in value). We've been looking long and hard for an ideal use-case for this guy, and sadly, we've yet to find it.